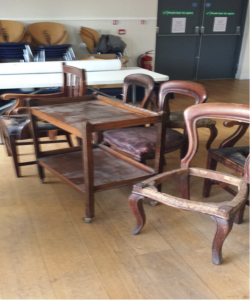 Cabinteely Tidy Towns Team, in conjunction with the Rediscovery Centre Ballymun, were delighted to have the opportunity to hold a Furniture Restoration Course over the last 5 weeks. Ten lucky locals took part in the free course kindly funded by Dun Laoghaire Rathdown County Council and supported by Local Agenda 21. The Local Agenda 21 Environmental Partnership Fund, which has operated since 1997, promotes sustainable development by assisting small-scale environmental projects at local level. These projects involve partnership arrangements between local authorities and various local groups including community groups, schools and environmental NGOs. The course took place in the Cedar Room in the Parish Centre on Friday afternoons from 2.30 – 5.00 p.m. and ran for five weeks from mid-January 2016. Participants were invited to either bring a piece of their own furniture or select one of the pieces brought by the Course Instructor Gerard Griffin to work on over the 5 week course.